Tetlow King Planning (TKP) have been retained by Retirement Villages Ltd to provide planning advice for their site at Lime Tree Village, Rugby. Lime Tree Village is set within the Warwickshire countryside and centred around the Edwardian Mansion of Cawston House. 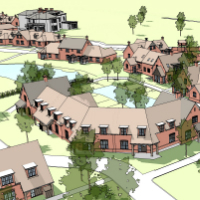 The site was an existing retirement village but TKP assisted in submitting a planning application for the extension of the village to provide further extra care accommodation and to extend and improve the existing village and facilities. This involved detailed negotiations regarding the provision of affordable housing on extra care schemes, content of S106 Agreements for the care and support services and occupation restrictions for the accommodation. TKP provide ongoing advice and continue to be heavily involved in the development of the site for the future. Lime Tree Village now has over 150 units and this number continues to grow.